★ 19th Newcastle Utd (a). ht:0-0. ft:0-4. "Hammers Crushed", "Newcastle cracked West Ham's resistance to launch their campaign with a thrilling second half display", "LuaLua crashed in a bullet header which James could only push on to the underside of the bar and then watch helplessly as it dropped over the line", "	Glenn Roeder could hardly believe what had happened, for West Ham had looked quite comfortable at the interval". The Star. 24th Arsenal (h). ht:1-0. ft:2-2. (cole, kanoute). 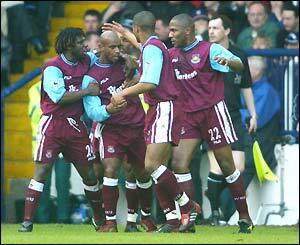 "The Arsenal winning run is over, and had it not been for West Ham's kamikaze instinct to throw away the game from a seemingly unassailable position, the Gunners would have lost everything in the sunshine at Upton Park", "Defoe then produced a low, whipped centre and his striking partner Kanoute was too quick and too sure of his finish for Keown to get near him", "A soft penalty, and an almost comical attempt at it by Kanoute, who shimmied, feinted and stuck such a meek and obvious shot that Seaman made the simplest penalty save of his long career", "There seemed little danger when he dodged Tomas Repka more than 25 yards from goal. However, with awesome power from his right foot, Henry then bamboozled James". And last but by no means least... "West Ham, for some reason brought on their very own clown, John Moncur". The Sunday Times. 31st Charlton (h). ht:0-2. ft:0-2. There were barely four minutes on the clock when Charlton took a lead which a more alert defence could surely have prevented", "Midway through the half, West Ham, were calling the tune", "Cisse went close", "Tomas Repka's point blank shot was blocked by Young", "Keily saved from Cole, but just a minute after that what should Charlton do but score again", "Cole got himself booked for a displeasing moment of petulance unworthy of so gifted a player". The Sunday Times. And we're bottom of the league! 11th West Brom (h). ht:0-1. ft:0-1. Did'nt get my hands on a paper for this one, however here are a couple of quotes from BBC Radio 5 Live's evening programme... "for 25 minutes West Ham were sublime, then they conceded a soft goal and fell apart", "Joe Cole had 9 shots on goal during the game", and after the final whistle had gone "Repka had to be restrained during a confrontation with angry West Ham fans". When is Glenn Roeder going to put Joe Cole on shooting practice? I wonder what the 'on target' ratio was for tonight's 9 goal attempts! ★ 5th Tottenham (a). ht:0-0. ft:3-2. (kanoute, sinclair). "Work this out. Spurs are second in the Premiership and West Ham are bottom - yet there is nothing to choose between them. Neither can defend to save their lives and both struggled to string three passes together", "Spurs went two-one up against a 10-man West Ham with only one point from the opening month. Game over, surely", "Then Di Canio's quick free-kick was floated into space behind the back four and Sinclair simply ran away from Thatcher to volley past the wrong-footed Kasey Keller", "In the end it took a massive slice of fortune to keep Tottenham's unlikely Championship challenge going. Gardner's 25-yarder was struck more in hope than expectation until a wicked deflection off Breen diverted the ball beyond keeper David James". The Sun Online. ✈ 21st Man City (h). ht:0-0. ft:0-0. "The poor start to the season has taken its toll on the Hammers. Kanoute plays without conviction, the midfielders are reluctant to get forward and gone is the sparkle that lifted them into 7th place last season", "The two best chances fell to Cole", "Di Canio remains skillful and inventive but in a team playing with such fear, his class seems almost out of place. Exasperated by the failure of the midfield to push forward, he threw his arms into the air and complained to manager Roeder standing in front of the home dug-out". The Sunday Times. 28th Chelsea (a). ht:1-1. ft:3-2. (defoe, di canio 2). "Defoe, praying on the looseball, sharp and quick as a cobra scored from point-blank range", "With skill that transcended all before it, Di Canio scored with his left foot from outside the area, a goal of such velocity, surprise and accuracy that we will see few better this season. Then after Zola had equalised with a phenomenal free-kick of his own, Di Canio had to do it all again and, marvellously, he did, six minutes from time from an angle so acute few footballers would even have tried", "Alarmingly, West Ham did as they had done against Arsenal and retreated into timid defence", "Poor West Ham? Not at all, in the 84th minute the ball bounced off the unknowing Defoe and trickled wide to the only man who could settle the afternoon. Di Canio, the purest of talents, knew he would deliver, and did so from a difficult angle". The Sunday Times. Bottom of the league... But smiling! ★ 1st Chesterfield (a) Worthington Cup (2rd). ht:1-0. ft:1-1. aet:1-1. (defoe). Win 5-4 on penalties. 5th Birmingham (h). ht:1-2. ft:1-2. (cole). "The three promoted teams have now visited Upton Park. West Ham have scored just one goal and taken just one point from those games. Little wonder the crowd vented their destress so loudly at the final whistle", "Minto was sleeping soundly by the byline as Stern John ghosted past him", "Breen's powder puff challenge was hardly worthy of a world cup hero", "West Ham's bamboozled defence were stricken by the heebie-jeebies whenever it came to clearing their lines", "DiCanio's luscious through ball was collected by Cole who left Jeff Kenna for dead, drew Nico Vasen and exquisitely clipped it into the far corner for a sumptuous goal", "West Ham abandoned all hope of precision in favour of a clumsy long ball approach". The Sunday Times. 19th Sunderland (a). ht:1-0. ft:1-0. "DiCanio's clever long pass picked out Sinclair, the winger was able to accelerate, unchecked, to the edge of the area, from where he beat Jurgen Macho with a spendidly struck right-foot shot which grazed the underside of the bar en-route to the back of the net", "Admittedly they rode their luck at times, but on this evidence the Hammers are better than the Premiership's bottom place they occupied yesterday morning". The Sunday Times. 23rd Fulham (a). ht:0-0. ft:1-0. (di canio/pen). "West Ham made a mockery of their woeful early season form by ripping Fulham apart with a all-action first-half performance - though they failed to find a winner until the dying moments", "On 35 minutes, Di Canio seemingly trapped next to the corner flag, nutmegged and turned Steve Finnan in one bewitching movement and teed up Trevor Sinclair, whose leaping volley was tipped over by Van der Sar", "West Ham sealed the points after Defoe nipped past Melville and was floored by Knight. Di Canio did the rest from the spot". The Sun Online. Yee Haaa! Give that man a new contract for f**ks sake! ★ 27th Everton (h). ht:0-0. ft:0-1. 2nd Liverpool (a). ht:0-1. ft:0-2. "West Ham arrived on the back of three good away wins, but were second-best throughout and had the disorganised, toothless look of relegation material", "West Ham are a febble bunch without Di Canio and Kanoute, and if there is a less accomplished centre-half in the league than Tomas Repka, his identity does not spring readily to mind. Even the good young players like Cole, Carrick and Defoe seem to have hit a wall in their development", "Pearce and Lomas together made a dreadful hash of what should have been the straightforward task of scoring in the midst of a frantic goalmouth melee". The Sunday Times. 6th Oldham Athletic (h) Worthington Cup (3rd). ht:0-0. ft:0-1. There are so many problems for Roeder to sort out. Hammers cannot win at home, have registered just two points from 18 in their own backyard, are short of confidence and have run out of ideas how to break down opponents", "the fans are showing more passion than some of the team - apart from the odd cameo role from the likes of Joe Cole", "maybe, just maybe, there might be some serious soul searching in the Hammers dressing room about commitment", "Dowie's dazzlers had more than a touch of the West Ham brand of 'Academy' football about them". The Sun Online. ★ 10th Leeds United (h) ht:1-4. ft:3-4. (sinclair, di canio 2/1pen). 17th Manchester United (h) ht:0-1. ft:1-1. (defoe). "AT LAST, Lady Luck smiled down on Glenn Roeder and West Ham United", "On balance, the Hammers deserved to win this game", "it was a fabulous goal by Nistelrooy, but the decision by the referee to allow the goal was controversial considering the strike he disallowed previously from Defoe", on Defoe "the 20 year-old had been the brightest striker on the pitch", "after a dancing dribble by Di Canio, the ball was poked through to Defoe, who struck the ball past Barthez. 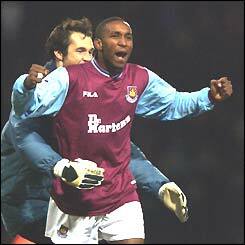 Upton Park erupted, and rightly so - just minutes earlier, Defoe had seen his clever lob bounce back off the crossbar with Barthez starnded". The Star. 23rd Aston Villa (a) ht:0-1. ft:1-4. (di canio). "It is beginning to look perilous for West Ham. They fought hard and were unfortunate to lose by three goals, but their deficiencies - lightweight forward line, misfiring midfield, leaderless back four - are self-evident, not least to the travelling support, who were chanting "what a load of rubbish" long before the end", "The goal sapped West Ham's brittle confidence and Villa began to control the game", "Di Canio's diving header from Sinclair's cross squeezed under Enckelman". The Sunday Times. West Ham are perparing for relegation by putting all contract negotiations on hold. They face losing 30 million should they drop into the first division". The Daily Mirror. ★ 2nd Southampton (h) ht:0-0. ft:0-1. Glenn Roeder looks doomed after his brave gamble failed to pay off, by playing three up front, including centre back Ian Pearce as a target man for Defoe and DiCanio to play off", "No other team in all four divisions has failed to muster a single victory at home". The Star. I listened to the radio commentry of this game and for 30 minutes we ran the show, making good chances, but failing to capitalise on any of them. As the game wore on we began to lose confidence, and you could sense a southampton goal coming... but to let one in 3 minutes into injury time was a real sickener! Oh Great! a nice extra time winner! 7th Middlesbrough (a) ht:0-0. ft:2-2. (cole, pearce). "Roeder really must spend his spare time running black cats over, walking under ladders and smashing mirrors", "West Ham arguably created the more menacing first-half chances", "Connecting with Defoe's pass following Pearce's knockdown, the swift reacting Cole, wide on the right of the penalty area caught Schwarzer off guard by shooting early from an ackward angle. His beautifully weighted effort flew across the goalkeeper and squeezed just inside the far post", "Creditably, West Ham refused to fold and regained the lead when Defoe's attempted shot following Carrick's determined interception and intelligent run deflected off a boro defender straight into Pearce's path. Meeting the ball on the half-volley he beat Schwarzer with the sort of stunning effort Boksic would have been proud to score", "Two minutes from time came Roeder's cruel denoucement as Ugo Ehiogu headed the equaliser from a corner". The Sunday Times. ★ 14th Man Utd (a). ht:0-2. ft:0-3. "The game was won within 17 minutes of a first half in which United swept through the flimsy West Ham midfield and past their plodding full-backs to overrun Tomas Repka and Christian Dailly", "Solskjaer hacked a clearance into Minto's face and the ball rebounded for Defoe to score. Minto was left with blood on his face - on that of the far-side linesman there was egg after replays showed him wrong to flag offside. Defoe also claimed a penalty when he went over P. Neville's legs in the first minute; but a truer reflection of the game is that Barthez did not make a save until Brown misdirected a header towards his own goal 13 minutes from time". The Sunday Times. 21st Bolton (h). ht:1-0. ft:1-1. (pearce). "Bolton were in no mood for giving presents as Ricketts equalised Pearce's first-half goal to give West Ham a long fight against history. No team has ever been bottom at christmas and stayed in the premiership", "Defoe's flick found Pearce. What followed would have brought a smile to the face of every centre-half with footballing pretensions. Showing the control and composure of a born striker, Pearce cut across the despairing Bergsson and settled himself before slamming the ball gleefully into the net", "The West Ham manager could expect no more from his players, and had Trevor Sinclair headed home the easiest chance of the match in the dying seconds, the New Year would be looking rather more promising". The Sunday Times. 26th Fulham (h). ht:0-0. ft:1-1. (sinclair-pen). "West Ham at least claimed a point in their 12th home game of the season when Trevor Sinclair's penalty cancelled out Sava's opener", "Sinclair hammered home from the penalty spot after Legwinski's 65th minute hand-ball", "Tomas Repka was sent off in injury-time for arguing with referee Dermot Gallagher". The Irish Times. 28th Blackburn (a). ht:1-1. ft:2-2. (o.g., defoe). 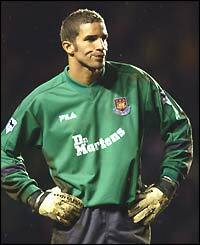 "With four minutes on the clock, David James made one of those errors surely destined to feature on a goalkeeping gaffes video! ", "Averting relegation is still possible - particularly if Michael Carrick remains in this sort of form", "Jermain Defoe equalised after Moncur had crossed to the far post where Pearce headed down. From there, Defoe nipped in front of the Blackburn defender and hooked the ball past a horrified Friedel", "It was the least West Ham deserved", "Roeder aims to enhance his prospects of avoiding relegation by making three signings, one of whom is almost certainly Robert Lee of Derby". The Sunday Times. 4th Nottingham Forest (h) FA Cup (3rd). ht:1-1. ft:3-2. (defoe 2, cole). "It was a classic cup tie, one of infinite surprise, not least that West Ham ultimately won it", "Roeder admitted that the late winner from the electric Defoe gave them what he felt they hadn't had so far this season: the rub of the green", "Defoe, receiving the ball from Cole, cleverly curled a shot past Ward", "Defoe sent Cole through, he drove his shot into the left hand corner for West Ham's second equaliser", "Forest could thank the hapless James for the opener, which evoked memories of the goal he so embarrassingly gave away at Blackburn last week". The Sunday Times. First home win of the season and West Ham sign Lee Bowyer from Leeds United on a 6 month contract! 11th Newcastle (h). ht:2-1. ft:2-2. (cole, defoe). "Lee Bowyer was greeted like a long-lost son before kick-off and applauded off Upton Park at the end of another frustrating afternoon", "Within five minutes West Ham were level. A throw-in, a flick-on by Caldwell straight across his own goal and Cole rounded Griffin to score", "Defoe's shimmy, turn and shot on the stroke of half-time flew across Given and into the far corner", " But just as West Ham were beginning to contemplate their first home victory (league) of the season, Jenas struck a volley into the top corner of David James net nine minutes from time", "By the end Bowyer's influence, fitful at best had waned completely and West Ham were hanging on". The Sunday Times. Five games unbeaten and off the bottom! ★ 8th Arsenal (a). ht:1-1. ft:1-3. (defoe). "Controversy reigned at Highbury yesterday", "In the lead-up to Arsenal's winner, Bowyer was clobbered by Dennis Bergkamp, he went to ground and should have won a free-kick, but ref Mike Dean played on and from the cross Henry rose to head home at the far post", "David James made save after save from the lightening quick Arsenal strikers as the defence in front of him crumbled", "Jermaine Defoe pounced on the loose ball and finished with style. It was his 23rd goal in his 38th start for the Hammers", "The Hammers have now conceded 43 goals in the league, easily the worst record". The Daily Star. West Ham sign Les Ferdinand from Tottenham until the end of the season. So we've signed a striker and a midfielder then... but I thought we needed to strengthen the defence! 22nd Charlton (a). ht:1-2. ft:2-4. (2 x o.g's). "West Ham step out of the Valley of Doom this morning with their premiership dreams in tatters. Glenn Roeder's team were torn apart by a Charlton team inspired by two-goal Scott Parker", "West Ham had been gifted the lead by a Rufus own-goal", "The game crackled with bad-feeling and it was easy to forget Les Ferdinand was making his West Ham debut", "Bowyer launched Parker over the advertising boards and into the front row of the crowd". The Daily Star. It is'nt looking good... is it? ★ 26th Manchester United (a) FA Cup (4th). ht:0-2. ft:0-6. "Manchester United produced a masterclass - while West Ham's pathetic performance could well be one of their last with Glenn Roeder as manager", "Two years ago, they came here and went away with a famous FA Cup victory as Di Canio grabbed the winner. Yesterday. there was no Di Canio, no spirit, no nothing", "This was Manchester United's biggest victory since their 7-1 Premiership triumph here three years ago over... guess who, West Ham", "Hammers barely put a move together and it must have been painful for the 9,000 fans who set off from the East End early in the morning only to witness this horror show". The Sun On-Line. 29th Blackburn Rovers (h). ht:0-1. ft:2-1. 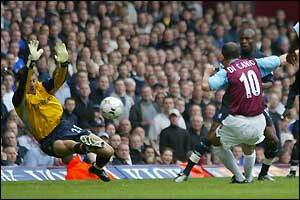 (di canio pen, defoe). At the 13th attempt, Roeder finally got the home win which might - just might - be the beginning of a West Ham dash to safety", "Just as the fourth official appeared on the touchline to signal stoppage time, and with West Ham on the verge of yet another night of bitter frustration, 20-year-old Jermain Defoe delivered a truly terrific goal", "teenage defender Glen Johnson, 18, made an impressive first start at full-back", "West Ham had been denied an opener by a cracking double save from Friedel", "The maverick Italian obliged from the penalty spot with a cheeky, trademark chip in the centre of the goal, with Friedel having already dived to his left", "Defoe proved why he is such a cracking prospect. Joe Cole switched play to the striker, who controlled the ball on his chest before finding a way past Lucas Neill on the edge of the box. He then delivered a quality finish, his right-foot shot whistling in at the near post to spark wild celebrations at Upton Park". The Sun On-Line. Our first home win in the league!... Come on you Irons! West Ham sign full-back Rufus Brevett from Fulham and David Noble (20) from Arsenal. "We are very positive about a young player that spent two years at Lilleshall with Joe Cole. They were partners in midfield and David chose the Arsenal route while Joe chose West Ham, as everyone knows" Glenn Roeder. ★ 1st Liverpool (h). ht:0-2. ft:0-3. "West Ham gifted Liverpool victory on a plate as a false dawn broke over Upton Park", "The game was over as far as West Ham were concerned after 10 minutes", "Gerard Houllier's side had only won one of their last 13 games", "After their inspiring win over Blackburn they should have been on a high, surging forward with purpose and challenging and fighting for every ball. So to see them roll over and show their underbelly like a newborn kitten must have been soul-destroying for the Hammers fans". The Daily Star. Joe cole is set to lead an exodus of talent (Kanoute, Defoe, Carrick and Di Canio) out of Upton Park should West Ham be relegated! The Daily Star. 8th Leeds United (a). ht:0-1. ft:0-1. "Bowyer was booed every time he touched the ball", "Di Canio and Kanoute were not fully match fit, both appearing somewhat rustier legged than of old, there powers of acceleration failing to match their speed of thought", "Joe Cole showed them the way, curling a lovely ball from the left which was missed by both visiting strikers", "Cole's swerving shot struck a post. Within minutes the Leeds goalkeeper played a more active part in concluding the afternoon's best move, saving impressively from Cole again after Bowyer's surge upfield and a fine crossfield pass to Di Canio had been astutely swept into the youngster's feet", and now for a classic quote from Roeder... "This was our best defensive performance for ages". The Sunday Times. Gary Breen slags off Roeder in the papers after another impressive performance for Ireland. He blames lack of discipline and organisation within the team, for West Ham's current relegation battle! Rumours start to appear of a dressing room brawl between Hutchinson and Di Canio. Paulo is said to have accused Don of 'lack of effort'. Hutchinson had to be restrained by Brevett amoung others, while Paulo made a swift exit?... So a nice tight ship for sunday's 6 pointer then... Come on you IRONS!!!!!! ★ 23rd West Bromich Albion (a). ht:1-0. ft:2-1. (sinclair 2). This was a match that seemed to have everything - goals, controversy, temper tantrums and all against the backdrop of the battle to maintain premiership status", "Steve Lomas broke clear down the left and swung in a cross which was met perfectly by Sinclair on the run. The Hammer connected and drove the ball past the hapless Hoult", "Unfit Paolo DiCanio went ballistic at boss Glenn Roder when he was hauled off four minutes into the second half", "James produced a handful of fabulous one-on-one saves to deny Lee Hughes, Scott Dobie and Danny Dichio the equaliser that the Baggies deserved", "In the 67th minute Bowyer crossed from the right, Defoe getting a touch and Les Feerdinand heading against the bar. The ball rebounded to Sinclair who nodded it straight past Hoult and wheeled away in celebration". The Sun. West Ham announce that they will not be re-newing DiCanio's contract. 1st Tottenham (h). ht:1-0. ft:2-0. (ferdinand, carrick). "The Hammers showed that they have the quality and desire to save themselves, in particular their young tyros - Joe Cole, Michael Carrick and Jermain Defoe. They were helped and given direction for an hour by a former Man of Tottenham Les Ferdinand", "The goal emanated from a truely wonderous piece of skill by Defoe. The ball had been played to him with Richards and Bunjevcevic right at his back. With masterful touch and dexterity the West Ham youngster flicked the ball over his shoulder, and by the time the two big central defenders had turned, Defoe was away from them, and then with precision his diagonal ball invited Ferdinand to shot from an angle 13 yards out. The shot was hard and low, but straight at Keller who could only deflect it ineptly across the goaline", "Once again the clueless Tomas Repka was exposed at set-pieces", "Tottenham, despite having three centre-halves on the field, allowed Ferdinand to challenge Keller in the air not once but twice. His pressure made the point and when Keller's punch dropped the ball towards the penalty spot, Carrick instantly swept it left-footed high into the net". The Sunday Times. THE BOTTOM SIX CLUBS... 08.03.03. 15th Everton (a). ht:0-0. ft:0-0. "Given the circumstances, West Ham's passive play was the more surprising. They need points and they need goals, yet for 45 minutes they could not muster a shot", "Neither Joe Cole or Michael Carrick could demonstrate sufficient guile in midfield to break the stalemate". The Sunday Times. 22nd Sunderland (h). ht:1-0. ft:2-0. (defoe, kanoute). "It was'nt a mirage. Indeed, had pressure been translated into goals, we could have witnessed a re-run of the record 8-0 by which West Ham beat Sunderland in 1968", "At right-back, in the composed and confident teenager Glen Johnson, the West Ham academy has unearthed yet another player of excellent technique. He did not miss a tackle nor waste one ball during the first half", "Defoe controlled the ball, turned with rapacious instinct and hooked the ball gently over Sorenson", "Carrick produced a measured ball between Bjorkland and El Karkouri. He and his partner were breathlessly swept aside by Kanoute, who then had the calmness and the fine precision to place his low shot past the hapless figure of Sorenson". The Sunday Times. 5th Southampton (a). ht:0-1. ft:1-1. (defoe). West Ham had the better chances initially, but were a goal down at half-time as Beattie scored his 21st goal of the season", "West Ham really should have been ahead, Les Ferdinand stubbed his big toe in failing to put away Bowyer's cross and Sinclair attempted a diving header that went a couple of feet wide", "Glen Johnson's long throw was not gathered by Niemi, nor cleared by the defence. Instead, the ball ran to Defoe, who smartly hooked it in after it had bounced". The Sunday Times. 2 home wins, 2 away draws... unfortunately Bolton keep winning! Surely they must lose soon! 12th Aston Villa (h). ht:1-1. ft:2-2. (sinclair, kanoute). "This draw leaves West Ham 3 points behind Bolton who they play next Saturday", "A sustained run by Kanoute, under pressure, gave him room for a fine cross that skidded off the Villa defence to Trevor Sinclair. His shot was so fierce that although Enckelman got to it, he could not stop it reaching the net", "Repka then recklessly conceded a penalty", "West Ham seemed to lose their cool, increasingly getting embroiled in petty incidents", "A glorious long ball by Cole found Kanoute, who controlled it and banged in West Ham's equaliser", "Defoe's dazzling solo run took him clean through to shoot, but Enckelman saved". The Sunday Times. 19th Bolton (a). ht:0-1. ft:0-1. "Glenn Roeder, who has deflected the disbelief of West Ham supporters all season long, finally looked like a man without an answer", "It would have been a big help had all the Hammers players, especially Kanoute, been as passionate as Roeder", "Okocha collected the ball midway in the Bolton half. He glided with such supreme balance, such unsuspected pace that the efforts of Cole to stay with him, even to foul him, simply fell behind in his wake. And then Okocha delivered a looping right-foot shot from outside the area that gave James not a ghost of a chance", "Bergsson was spared by West Ham's inability to control their anxiety for long enough to take aim. Sadly this was encapsulated by Defoe. The young player who had done most to keep the bubbles afloat this season was clean through after 76 minutes, but he snatched over-eagerly at a chance from 11 yards, drove it wide and held his head for the second successive profligate match". The Sunday Times. 21st Middlesbrough (h). ht:0-0. ft:1-0. (sinclair). "The first half, was in truth, pretty poor, bar a couple of good chances from Joe Cole", "13 minutes to go and Glen Johnson sprints down the right flank with frightening speed. He cuts inside along the by-line, and is presented with three options: cross into the area, take an ill-advised shot which might result in a corner, or look up and pass to the waiting Sinclair, who will sweep the ball into the bottom left hand corner. The Boleyn erupts", "Out went the wild, desperate frustration of late, and in came some control and a few level heads, which kept the team going right through to the final whistle. Les Ferdinand was paramount in this. On an even more positive note was Sinclair going straight to young Glen Johnson to thank him for his superb role in the goal - it was fantastic to see spirit between old and new." taken from the KUMB Website. 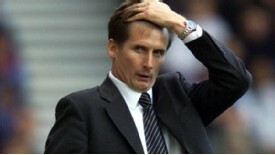 Glenn Roeder suffers a minor stroke after the Boro game. The Board appoint Trevor Brooking as caretaker manager. ★ 27th Man City (a). ht:0-0. ft:1-0. (kanoute). "Jermain Defoe tapped a short corner to Joe Cole, his diagonal ball into the box was headed straight towards Schmeichel until another substitute Don Hutchinson poked out a boot. Schmeichel managed to block, but the ball rebounded to Hutchinson whose shot hit the post. The ball screwed back across the goalline to where Kanoute was waiting to deliver the touch that could yet prevent the Hammers from falling out of the Premiership after 10 years. ", "Only 6 minutes earlier, Brooking's nerves were stretched to the limit when Niclas Jensen headed a Defoe hook shot off the line", "Brooking was all smiles as he exchanged high fives with every one of his players as they left the pitch". The Daily Star. THE BOTTOM SIX CLUBS... 27.04.03. ✈ 3rd Chelsea (h). ht:0-0. ft:1-0. (DiCanio). "Brooking fielded three up front, West Ham true to their traditions, would try and score their way out of trouble", "Kanoute held the ball before feeding Joe Cole who sent Sinclair to the byline with a perfectly weighted pass, Sinclair centered, the ball looped off Babayaro's shin and arrived to DiCanio, who swept it high into Cudicini's net. The shirt came off, the arms went up and the tears began to flow", "Frank Lampard seemed to have scored when he beat James after getting a free header at a corner. Rufus Brevett hacked it off the line", "By the end Upton Park was blowing bubbles loud and clear while Chelsea, were barely in it during the second half as West Ham's passion washed them out of town", "One Trevor Brooking sang the denizens of E13". The Sunday Times. The double over Chelsea... SWEET!... And so it's all down to the last day of the season. Bolton at home to Middlesbrough? What's the betting we go down on goal difference in classic West Ham style? However the appointment of Brooking has brought back some much needed pride in the club, and I hope we do it just to see Brooking's face! Come on you Irons! ★ 11th Birmingham (a). ht:0-0. ft:2-2. 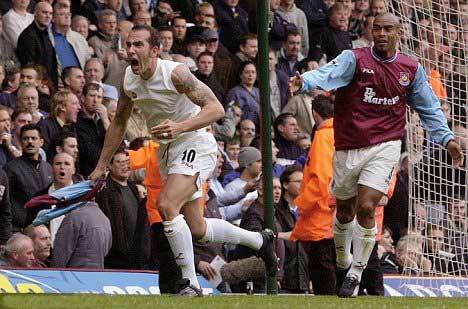 (Ferdinand, DiCanio). "Even Trevor Brooking's magic failed as West Ham's Premiership dream finally died", "They battled, fought, harried and dominated at St Andrews in a desparate bid to stay up, they even took the lead, went behind and equalised through - you guessed it - Paolo DiCanio. But in truth their destiny was never in there own hands", "Just for a few seconds in the second half there was hope as Ferdinand gave them the lead, and Ricketts grabbed one back at the Reebok, but the miracle never happened", "To think that West Ham got to that 42 point tide-mark is incredible, but in the end a side packed full of talent was not too good to go down", "We'd like to keep the nucleus of a side to bounce back but rash promises would be silly - Trevor Brooking" The Daily Star. THE BOTTOM FOUR CLUBS... 11.05.03. 12.05.03. Jermain Defoe hands in a transfer request! 13.05.03. West Ham refuse Jermain Defoe's transfer request! 17.05.03. West Ham release 10 players, including Paulo DiCanio, Gary Breen, Nigel Winterburn, Lee Bowyer, Scott Minto and John Moncur. 18.05.03. Trevor Sinclair announces he is happy to stay at the club. 11 x Jermain Defoe. FA Cup = 2, Worthington Cup = 1. 9 x Paolo Di Canio. Penalty = 3. 8 x Trevor Sinclair. Penalty = 1. 5 x Joe Cole. FA Cup = 1.